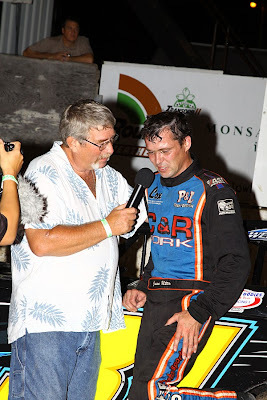 Auto Racing Independent: My Two CENT$ - "The Voice"
Davenport, IA - Earlier this summer when I was at the pit shack for a Deery Brothers Summer Series race at West Liberty Raceway the light bulb turned on. Getting inspiration for column topics can come from the weirdest ideas or from the serious situations that I think about concerning dirt late model racing. As I was checking in for the race I did my usual thing and signed in on the release form for my pit pass. In most cases at many tracks you sign your name and describe your duties or media affiliation. As I signed in, I looked right above my name and under duties I saw, “The Voice”. It had nothing to do with the hit NBC television show but described the duties for that night’s announcer, Jeff Broeg from Mount Pleasant, Iowa. Jeff is a very talented writer and columnist but he is also a very good announcer. 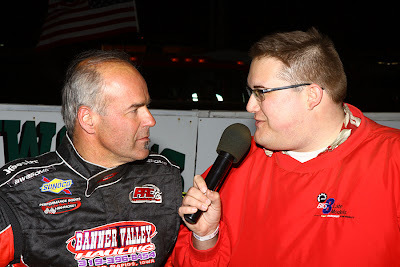 It made me think about how important an announcer is for a great night of racing and I knew that night the fans would be informed, enlightened and entertained. During the drive home I kept thinking about “The Voice” and just how important the job of announcer is for racing to be successful. It is probably the most important job at the track. If you think about it, what type of sporting event does not have an announcer? They all do. Why, because it’s that important. As humans (at least most of us are) we need to know stuff. Even if we think we know, we need to hear and listen about who, what, why, where and how, of things that we see. Just think about this. How good would the experience of watching TV be if we did not have sound? Ok, maybe it would be better for a NASCAR race but overall it would be unsatisfying. We need talking heads, folks who can inform, enlighten and entertain us. Announcers bring audio stimulation to our senses. Without announcers we would just stare off into the sunset and leave the races wondering who won while we were standing in the beer concession line. The famous boxing announcer Michael Buffer has the classic line “Let’s Get Ready to Rumble” and when he does that it ignites the crowd and TV audience. It’s exciting and makes you feel pumped up for the event. Now that’s probably an extreme and may be over the top for the average dirt track but I think every announcer has their own way to Fire up the crowd. One of my favorites has always been Jerry Mackey who has been doing announcing for 30 years. His “Hello Races Fans” at the beginning of the night and his closure “And we’ll see you at the races, good night everybody” still to this day makes me feel good and appreciated for coming. 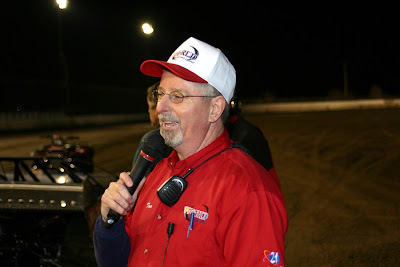 When I think back to when Hav-A-Tampa came to Davenport Speedway, their long time announcer Roby Helm would play to the packed grandstand crowd like a fiddle and the roar would echo when he introduced the cars and stars of the series. Every series and track has “The Voice” and honestly I’m in awe on how they do their jobs. To be quick witted and talk without hesitation to thousands of die-hard fans is hard and they make it look so easy. Over the years I’ve been lucky to get to know most of the guys on the touring circuits who rattle the microphone and beat the drum. 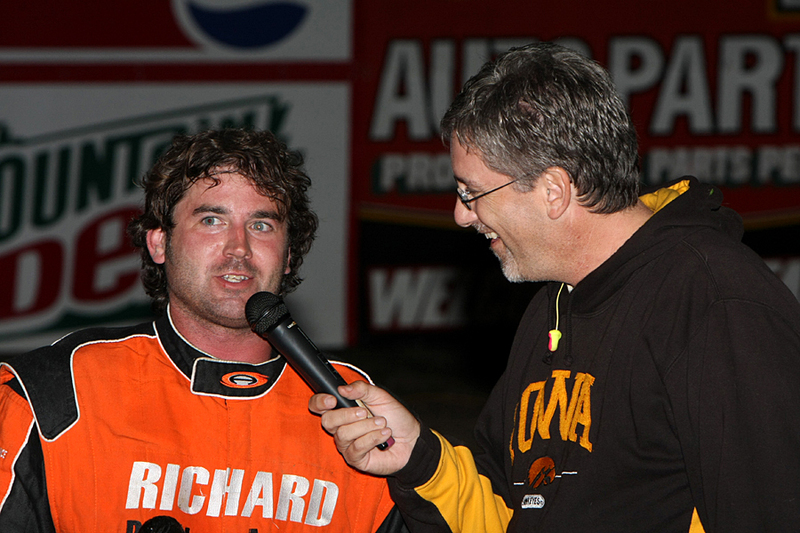 In many ways the announcer becomes the voice and face of the race or series to the fans. It would be hard for me to think about the Lucas Oil Dirt Late Model Series without James Essex with his classic cool sounds. He has become gold standard for excellent work and expert commentary. On a sad note I was sorry to hear earlier in the year that former World of Outlaws Late Model Series announcer Rick Eshelman has taken a sabbatical from the rigors of the road. Rick does an outstanding job and brings a big ring wrestling hype that most others could not pull off. His enthusiasm, nick names and theatrics are entertaining. I still find his Uncle Sam outfit for the “Firecracker 100” at Lernerville Speedway to be very neat. The Voice that has always resonated to me as almost perfection would be that of Bret Emrick. His radio tone during all the early years when I huddled in the Eldora Speedway grandstand while watching time trials or pre-race commentary still amplifies in my mind. 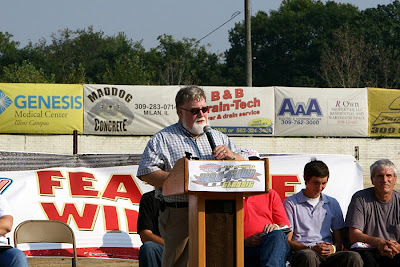 The current WoO Race Director is still a star. 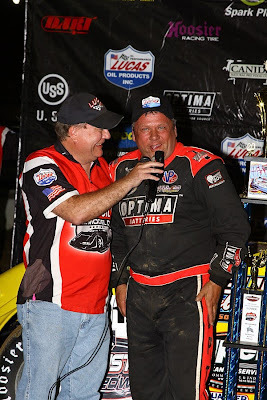 Not that those others don’t have these qualities but when I think of professionalism, attention to detail and hardworking I remember Tom Lathen and what he did for the World Dirt Racing League. Tom always was cool under fire and made his commentary fresh and thorough. He always had interesting side notes on the drivers and took care of all sponsors. It was always a pleasure to listen to his work. I’d be remiss if I didn’t mention the patriarch of the Iowa/Illinois Quad City area announcers with that being Phil Roberts. He has done it all over his career while at the track but also with his renowned old radio show “Around the Track”. I can remember listening to him and his weekly stories. His firsthand accounts of the racing action and a journalistic quality have made him the example for perfection that others should try to follow. The future is upon us and luckily we have young talented announcers honing their craft while adding their new flair to the chore. Guys like Ben Shelton currently filling in for the Outlaws and doing the Dirt on Dirt broadcasts. 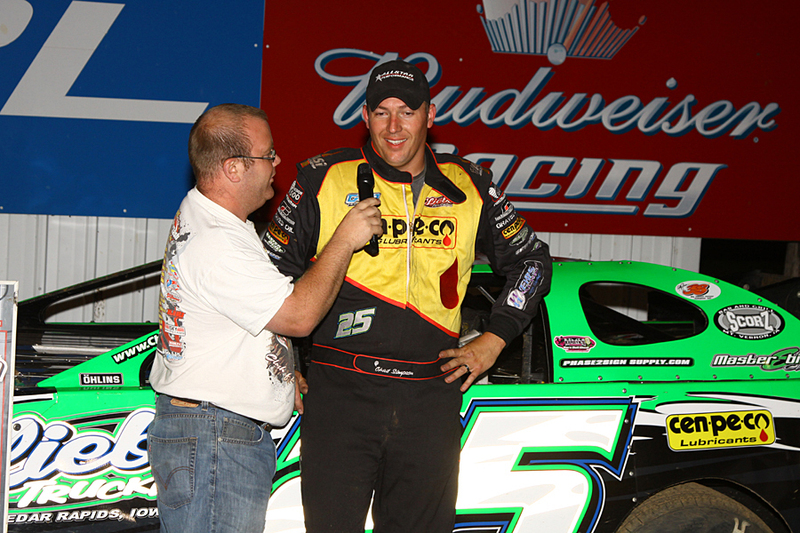 Dustin Jarrett has one of racing’s biggest stages at Eldora Speedway which could make him legendary. Around Iowa we have Ryan Clark with Independence Motor Speedway and Kyle Bentley with the Corn Belt Clash who will make their mark and have announcing greatness. Last but not least I’d like to mention Eric Huenefeld. 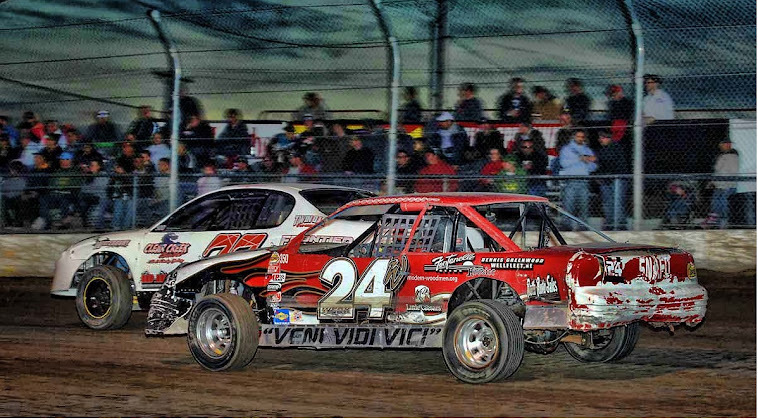 Whether its dirt, asphalt or Friday night football, Eric is can do it all. I only hope he stays with racing and when he goes Big Time, we can say we heard him first. For all of you who have ever announced racing events past or present I thank you for what you do for racing. I wish I could mention you all as you all deserve it. On all of your shelves, bookcases and fireplace mantles you should have a golden microphone with no more description than the “The Voice,” it says it all.